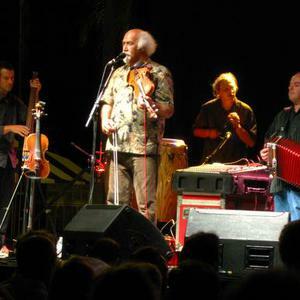 Michael Doucet (born 1951) is a Cajun fiddler, singer and songwriter who founded the Cajun band BeauSoleil from Lafayette, Louisiana. In 2005 Doucet was one of 12 recipients of the National Heritage Fellowship by the National Endowment for the Arts. The NEA award, which recognizes artistic excellence, cultural authenticity and an artist's contributions, is the highest honor in U.S. folk and traditional arts. Doucet received a 1998 Grammy for work with Beausoleil. In 2005 Doucet was one of 12 recipients of the National Heritage Fellowship by the National Endowment for the Arts. The NEA award, which recognizes artistic excellence, cultural authenticity and an artist's contributions, is the highest honor in U.S. folk and traditional arts. Doucet received a 1998 Grammy for work with Beausoleil. He was named a 2007 USA Collins Family Foundation Fellow and awarded a $50,000 grant by United States Artists, a public charity that supports and promotes the work of American artists. He learned the banjo by age six, the guitar by his eighth year, and was researching Cajun music as a college student. In his youth he performed as part of a duo at a music festival in France. At the festival he was exposed to centuries-old French music, which he identified with the Cajun music of French Louisiana. In 1975, Doucet received an NEA Folk Arts Apprenticeship Grant to study Cajun fiddle styles from masters such as Varise Conner, Hector Duhon, Canray Fontenot, Lionel LeLeux, and Dennis McGee. Doucet's individual style incorporated elements of Western swing, 1930's string band and Creole music, into traditional Cajun music. Doucet learned late 1800s and 1900s tunes passed on by McGee. He revived many the old Cajun songs that had not been recorded and whose musicians of that era were gone. In 1977, Doucet started educating public school children about Cajun music. Later as an adjunct professor at the University of Louisiana at Lafayette, he designed and taught the first university course on Cajun music. Doucet was originally a member of the mid-1970s Cajun/rock band called Coteau. During that same time some of his friends and he formed his current band, BeauSoleil, which was purer to Cajun musical tradition. He also performs with the bands Fiddlers 4 and The Savoy-Doucet Cajun Band (with Marc Savoy).